Valentine’s Day is right around the corner and we are selling lots of Filet Mignon steaks. We also get a lot of questions about cooking them and figured it was an opportune time to put together some information on how to prepare them perfectly and shed a little light on the steak voted most likely to increase the birthrate in November. The number one question that we get about Filet Mignon is: Why are they so expensive? The answer is simple. Supply and demand. The average weight of the cattle that we harvest is around 1350 lbs per head, of that only about 7.5 lbs turns into Filet Mignon steaks. So there just isn’t that much to go around. The Filet Mignon comes from a cut of meat called the PSMO that is located toward the hind end of the animal on the bottom side of the spine. It is a muscle that is seldom used by the animal, therefore it remains very tender. BUT, with proper aging, Filet Mignons can be cut with a fork and will literally melt in your mouth. 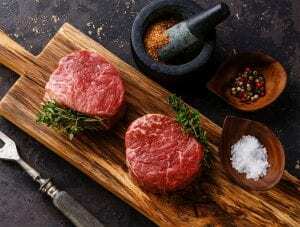 What is the best way to cook a Filet Mignon? The answer is a little more complicated this time, but regardless of the cooking method, the goal is the same – cook to an internal temperature of around 115F – 125F (depending on how you like it cooked) then allow it to rest for 5 minutes or so before serving. There are many ways to cook a steak, but we have found the most consistent way to get the perfect steak every time is by using a consistent process. We utilize an aggressive pan sear followed by a brief rest then cook to the desired internal temperature in a 400F oven. Following this procedure allows us to ensure a perfect steak each and every time. When it comes to “doneness” on steaks, Filet Mignon in particular, we encourage cooking them to Medium Rare at the most. Filets are generally a little thicker than other steaks of comparable weight and two ovens seldom cook exactly the same, so it’s hard to call out an exact oven time/temperature to cook the perfect steak. However, it is possible by simply using a good digital meat thermometer to determine the temperature inside the steak. When we cook Filets, and most other cuts, we generally pull them from the oven when the internal temperature of the steak reaches approximately 115F and allow them to rest for 5 minutes or so before we slice them. This will result in a Rare to Medium Rare, and that is how we like them. Others prefer steaks a little more “well done”. USDA states that an internal temperature of 140F is medium rare, but cooking the steak to 140F in the oven will generally result in something closer to “Medium Well – Well Done” as the internal temperature will continue to coast up while the steak is resting. Ultimately, it takes some trial and error to find your “happy place” when it comes to internal tempature, but regardless of the means of cooking, we cannot recommend a good digital meat thermometer highly enough. Is the quality of a frozen Filet Mignon as good as fresh? The answer: Depending on the process, frozen products can actually be better than fresh. We design our products from the ground up to be frozen. Many other companies freeze as a way of keeping product from spoiling. Our whole company is designed around a frozen product line and we’ve put a lot of time into developing the best aging, cutting and freezing process in the business. We lean heavily on Clarence Birdseye’s playbook and we are aggressively concerned the consistent quality of our products. Cooking the perfect Filet Mignon begins with the thawing process. Thawing any frozen product is very important to how it performs on the plate. While our goal is to freeze our products as rapidly as possible which forms the smallest ice crystals and maintains the best quality of product when they are frozen. Thawing is the opposite. The whole point of freezing rapidly is to minimize the size of ice crystals within the cellular structure of the meat. Thawing slowly is the best way to minimize damage to cellular structure as the product warms up. Our recommendation is to thaw steaks overnight in the refrigerator. If one is in a hurry, thawing in a pan of COLD water will speed the process greatly and will not affect the quality of the product adversely. However, thawing in warm or hot water will begin to cook and de-fat the outer layers of the steak and can create a very inconsistent product. We never recommend thawing in the microwave as this will almost always damage the product severely. What do we recommend for marinades? In short, we generally don’t recommend them for our aged steaks. Although, marinades have become more popular over the past couple decades and they are generally intended for cuts of meat that are tougher or more strongly flavored than properly aged premium beef. Wild game & fowl, lower grade beef, etc, but some folks simply prefer the flavor of a marinated steak to non-marinated. We do not judge. If a customer wants to marinate our products we recommend using our Top Sirloin, flank or skirt steaks as they are leanest and will stand up to the marinating process the best. Using a steak like a Filet Mignon in a marinade can get a little sideways, especially if one tries to marinate an already well aged, high quality cut of meat. Marinade, especially vinegar based marinades, are designed to help break down muscle fibers (tenderize) – which is exactly what we have already done in our aging process – a marinade in addition to aging can result in the steak coming apart altogether prior to cooking. So, if you’re thinking of marinating one of our Filets, we would recommend against it in favor of your favorite dry seasoning applied just prior to searing the steak. What about finishing a steak with melted butter? Finishing a steak with melted butter is another fairly common practice and it is one that really comes down to personal preference. We do like a 50/50 blend of butter and olive oil for searing steaks as it tends to put a crust on them a bit more quickly than oil alone, this means they cook less in the searing process. Basting a steak with melted butter once it’s cooked will add a layer of flavor – butter flavor – and it will add a savory texture to the steak. We generally do not butter finish our steaks, but we know plenty of people who do and swear by it. However, a great Filet Mignon doesn’t need butter. If you make the decision to finish with butter, we cannot recommend strongly enough that you use AA Unsalted butter as the difference in flavor between AA and A butter is significant. What is our favorite seasoning for steak? Truth is, we like variety. But the seasoning that we always come back to is our original Signature Seasoning. It is designed from the ground up as “steak seasoning”. We use large kernels of salt and pepper blended with finer ground seasonings to deliver a one of a kind experience while bringing out the absolute best in the steak that it’s applied to – considering look, texture and taste. 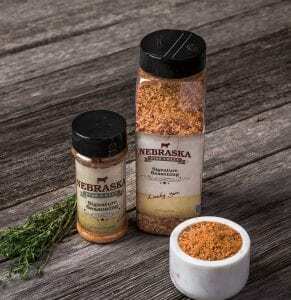 Other seasonings focus solely on flavor, but by using a more coarse blend we believe that it truly rounds out the premium steak experience and is seasoning enough to stand up to any steak without taking away from it’s natural flavor. What wine pairs best with a Filet Mignon? Generally speaking, filets are a little more delicate cut; more lean and less toothsome than a NY Strip, Top Sirloin or Ribeye. Our selection for a Valentine’s Day drink pairing would be as follows … if you don’t already know, ask your special someone’s best friend what their favorite adult beverage is, and serve it with the perfect steak. If you need a back up, we recommend a mid to upper shelf Cabernet Sauvignon, Cabernet Franc, Syrah, or Pinot Noir. 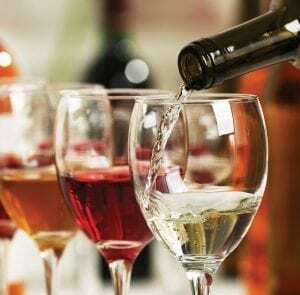 One can get away with a strong Chardonnay, so long as one is not overly concerned with absolute etiquette, but moreover, get your date what they like – cooking them a nice dinner is about them and having fun more than it is a bottle of wine … or beer … or Martini. Last note; if you do go with a Cabernet, it’s a good idea to make sure it’s got some age on it. Young cabs are generally a little more edgy and better with less delicate steaks; Top Sirloin, NY Strip or Ribeye. Long story short, there are a lot of “right ways” to eat a Filet Mignon. At Nebraska Star Beef, we have always been fans of keeping it simple and doing things right. When it comes to a Valentine’s Day surprise, whether it’s for him or for her, there is no better way to the heart than through the stomach and a Nebraska Star Beef Filet Mignon is the perfect way to show them how much you care.